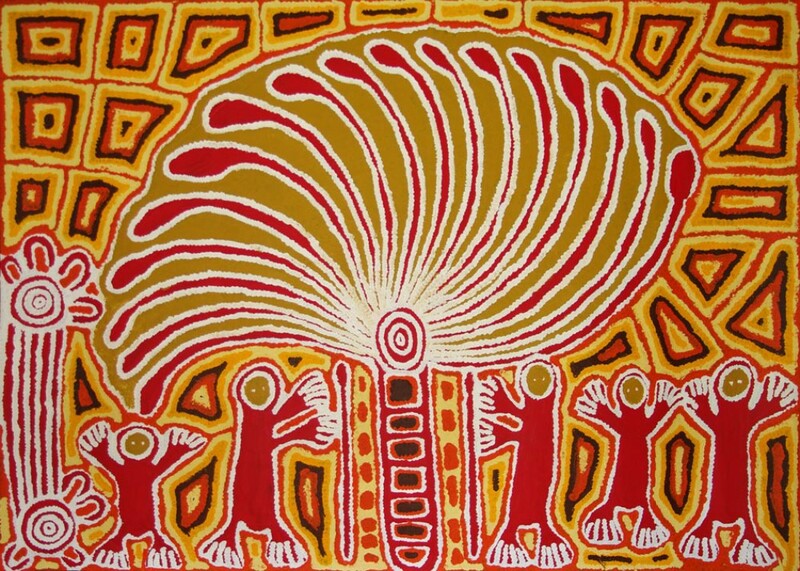 Subjects and Themes(Dreaming): Linda has formed a distinctive style that combines her Christian beliefs and traditional Aborigina Dreamtime stories. Her paintings include the themes of "Sulky Man" and "Kangaroo Man" which depict both mythological stories and actual events of traditional life in the desert. One style in particular that Linda is popularly known for painting depicts a windmill, which her family came upon at the time they walked out of the desert, and believed was some kind of monster. Linda was born in 1937. She is a Pintupi woman from Lake MacKay in the Gibson Desert in Western Australia. Linda's Aboriginal name is Tjunkiya Wukula Napaltjarri. She lived a traditional nomadic life with her people until the age of about eight. At this time her family walked out of the desert and decided to settle at the Lutheran Mission at Haasts Bluff in the Northern Territory. Linda's father was killed when she was young. Her mother later married artist Shorty Lungkarta Tjungarrayi. His work was a significant influence on Linda's painting. Linda married several times, and still uses the family name of her second husband Musty Syddick (Cedick). Linda Syddick Napaltjarri collects the stories from her life into a series of images that represent the major turning points in her journey. One such incident was the first contact experience when her family group first encountered white people. Linda Syddick Napaltjarri was an eight year old child at the time and it was a memorable event in her life. She tells the story of how a traditional medicine man followed with their party first encountered a windmill at Mt Liebig. While Linda's adoptive father, Shorty Lankata Tjungurrayi, had contact with white settlers before, most of the party had not. Linda Syddick Napaltjarri recounts how the witchdoctor drew on bush magic to quell the fierce windmill that he saw in the early morning. Looking more like a demonic spirit, the windmill proved to be immune the old witchdoctor's magic. It was Linda's father who finally was able to persuade the old man that the machine was not an evil spirit. This story and other stories of desert survival are direct from the voice of someone who was there at those first encounters. Linda Syddick Napaltjarri draws on metaphysical stories she later learned in the mission settlements and fused them with her memories of the desert and Tingari Creation events. 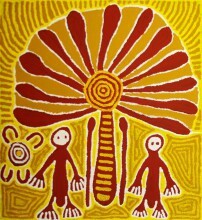 Linda first exhibited her work in Alice Springs in 1991. 1995 One year fellowship, Australia Council for the Arts. 2003 Visual art grant $11,000, Australia Council for the Arts. 2004 Highly Esteemed, Alice Springs Art Award. Four times finalist in the Blake Prize for Religious Art. 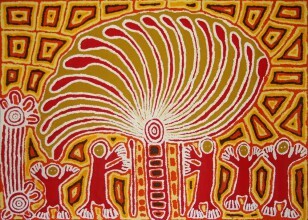 Linda has formed a distinctive style that combines her Christian beliefs and traditional Aboriginal Dreamtime stories. One style in particular that Linda is popularly known for painting depicts a windmill, which her family came upon at the time they walked out of the desert, and believed was some kind of monster. She tells the story of how a traditional medicine man followed with their party first encountered a windmill at Mt Liebig.